The coaching staff, made up of Bob Johnson and assistant Ted Sator, previously coached the 1981 Canada Cup team that was crushed 9-2 by Sweden in the semifinal. In the six years since that tournament, the pair saw American talent developing, particularly on the back end. "In 1987, there was a plethora of outstanding defensemen. We got [Gary] Suter and [Phil] Housley and [Rod] Langway. Then we had goaltending with [Bob] Mason, [Tom] Barrasso and [John] Vanbiesbrouck. Arguably, we had the best coach in Bob Johnson. I idolized the man and loved working with him," Sator told NHL.com. "We knew we didn't have the firepower to compete with these teams. We had a defensive scheme in place. We only allowed 14 goals in five games. The downside was we only scored 13." With a forward corps made up largely of crashers Chris Nilan, Curt Fraser and Joel Otto, the team was among the youngest in competition. Its core was made up of young up-and-comers Pat LaFontaine, Kevin Hatcher, Suter and Housley, key pieces all 23 or younger. But with Johnson at the helm, the team came out fighting. After opening the tournament with convincing wins over Finland and Sweden, the Americans faced a powerhouse Canadian team that had started flat in a tournament-opening 4-4 tie against Czechoslovakia. Facing off against a roster stocked with superstars, the USA was determined to show it belonged. "The quality of the players in that tournament was unreal. You're looking at Messier, Mario, Gretzky, Coffey, all on the same team. You go, 'Wow, what are we up against?'" said Joe Mullen, a veteran leader on the team alongside Chris Chelios, Ed Olczyk and Mark Johnson. "We had to go in with a positive attitude. We knew we could surprise a lot of people." In one of the most physical games of the tournament, the Americans lost a tight 3-2 game. 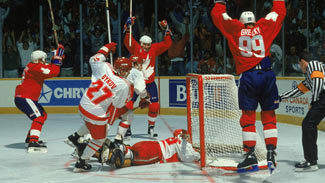 Mario Lemieux scored all three Canada goals, with Wayne Gretzky and Mark Messier providing the assists on the last two. After the U.S. team had kept pace with Canada for much of the contest, Johnson was livid following the final whistle, hunting down the game's referees in protest over the quality of the officiating. "That was a real physical game. Russia was one of the top teams in the world, but the U.S. was on the rise," said Kevin Dineen, a Canadian forward who suffered a tournament-ending ankle injury in the contest. "I think there was a lot of pride in USA Hockey. It was both teams playing for keeps." The United States lost its last two games to the Soviet Union and Czechoslovakia, ultimately finishing fifth out of six teams. But their competitive play against a Canadian team featuring 12 future Hall of Famers laid the groundwork for a huge victory at the 1996 World Cup. 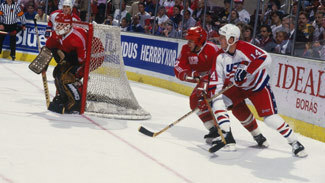 Featuring six players from the Canada Cup roster, including Chelios, Suter, Housley and LaFontaine, the 1996 U.S. national team had added a bevy of young talent. The talented, physical bunch shocked Canada in the World Cup final, placing the United States atop the international game. "We hadn't beaten the Canadians a lot over the years. There were some young men by the name of Mike Modano, Bill Guerin, Keith Tkachuk and Brian Leetch that helped solidify us. It was great to see," said Housley, who still sees that World Cup win as a key moment in U.S hockey. "It brought back the same memories as the 1980 Olympic team. It re-energized the whole country. You can see it with how the depth of American hockey has gotten so much stronger." The victory in 1996 inspired a new generation of American hockey players, but the first few building blocks were laid in 1987 -- especially in a tightly contested game against Canada, where an outgunned U.S. squad showed it could compete with the best. "In years past, USA was a gnat to Team Canada," Sator said. "If you want to form one of the best hockey teams in the world, you have to slay the king."